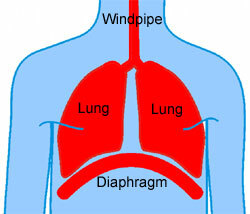 Diaphragm is the main functional unit of the chest area of body. It is divided into two halves i.e. left and right part from the midline connecting both. There is a tendon and pericardium connecting both of the side. The one side of diaphragm either left or right serves as a complete functional unit and known as hemi diaphragm. Each hemi diaphragm have its own complete nerve supply and also its own complete independent functioning. The right sided hemi diaphragm is considered stronger as compare to the left one because of the presence of liver on right side of human body. The hemi diaphragm of left side is less strong as compare to the right hemi diaphragm. Sometimes, in radiology reports, a small bubble of air is seen under left hemi diaphragm. The bubble appeared is dark and less dense inside the stomach. On left sided hemi diaphragm, heart is present and is more sensitive. Left hemi diaphragm is more susceptible to pneumonia. The most common problem reported regarding left hemi diaphragm is elevated left hemi diaphragm. Due to this, the patient may feel short breathe, pain in chest and cough along with bronchitis or cardiac arrhythmias. The right sided hemi diaphragm is considered stronger as compare to the left one. The right hemi diaphragm is normally a bit higher as compare to the left one because of the accommodation of liver at that side. The problem of elevation is also reported with right sided hemi diaphragm. The elevation may be within, above or below the hemi diaphragm. This elevation of right hemi diaphragm may be due to any cyst presence, an infection, accumulation of fluid forming abscess, accumulation of blood i.e. hematoma, presence of a tumor and any inappropriate surgery of abdomen. If both sides of diaphragm i.e. left and right diaphragm are having paralysis then it is known as bilateral diaphragmatic paralysis but if hemi diaphragm is effected by paralysis then this paralysis is known as unilateral diaphragmatic paralysis. It is most common in males. In hemi diaphragm paralysis, the work load increases on diaphragm and cause intense contraction, and this increased effort for breathing cause fatigue in the related muscles and as a result ventilatory failure occur. The patients who do not get recover from the hemi diaphragm paralysis, may lead to dyspnea demanding more ventilation in body. The hemi diaphragm paralysis is most of the time asymptomatic and only show symptoms when it is accompanied by dyspnea. The treatment is not needed only for paralysis but only recommended if dyspnea get out of control. The main cause behind hemi diaphragm paralysis is treatment of dyspnea. If there is any anatomical defect, then surgery is an option for treatment of hemi diaphragm paralysis. The nerves effected during paralysis are also treated with medications. Some patients with severe dyspnea and paralysis, have to be under ventilator on the basis of etiology, that may be short term and long term i.e. life time.